Well, I did it (yay me), and it ended up being really fun. I must tell you with all the double centuries and everything I've done, this was the hardest ride by far. 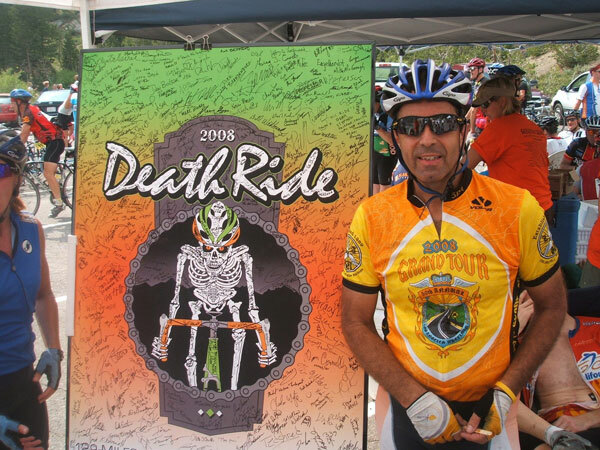 I'm talking about the Death Ride, 129 miles, 15,000' of climbing, five passes over 8,000' high. It took me ten hours, which means I spent about eight hours riding uphill at altitude. And the whole time I was passing people, I actually feel like I did really well. Wow. This story really began on Friday, as I drove from my house in Westlake Village to Walker, which is just south of Lake Topaz, where I was spending the night. You may recall I had decided to drive up Route 33 and visit the San Andreas Fault, and ended up driving on a dirt road across the Carrizo Plain to Soda Lake. It was amazingly beautiful, a land untouched by man, I highly recommend it. However just there, miles from nowhere, I had a flat tire. I mounted my token spare in 105o heat and took off for Bakersfield to find a new tire. Two hours and about thirty phone calls later, I managed to locate a 285/35 ZR19 (a weird size, basically a racing tire) and two hours after that I was on the road again. The whole incident cost me six hours and I couldn't recover, limping into Walker at 1 AM. And I had to get up at 4 AM to get to the ride. Yawn. Coffee was definitely a performance enhancing drug. 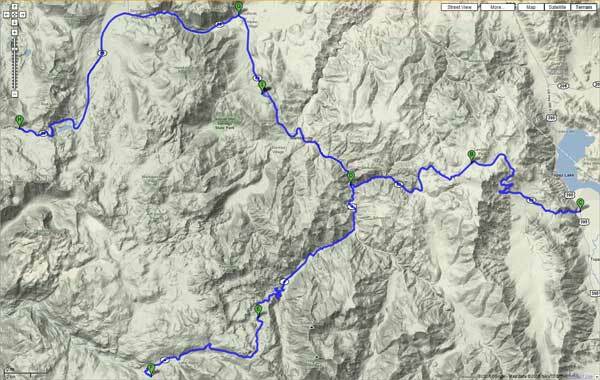 You start in Markleeville, about 5:30AM, and begin by climbing up to the Monitor Pass (8,314') from the West, about 8 miles at 7%. We did this as the sun was coming up, really spooky. After cruising across a beautiful high meadow, you descend down down down to Lake Topaz, the "low point" (about 5,000'), while admiring the beauty of the Antelope Valley (and thinking about the fact that you have to climb all the way back up!) Then you turn around and climb the Monitor Pass from the East, about 10 miles at 8%. The sun was blazing already, and this part of the ride is unsheltered. By the time you reach the summit your legs are nicely toasted, and you are only 1/3 of the way into the ride! ... and then descend all the way back to Markleeville. And this year for added coolness, it rained on the descent; I was frozen and soaked by the time the ride ended, even though earlier I had baked in the sun. I really felt bad for all the people behind me, many of whom had to climb up to Carson in the rain.